The dried fruit of the plant, Piper nigrum L, generally known as pepper, is an important tropical spice. 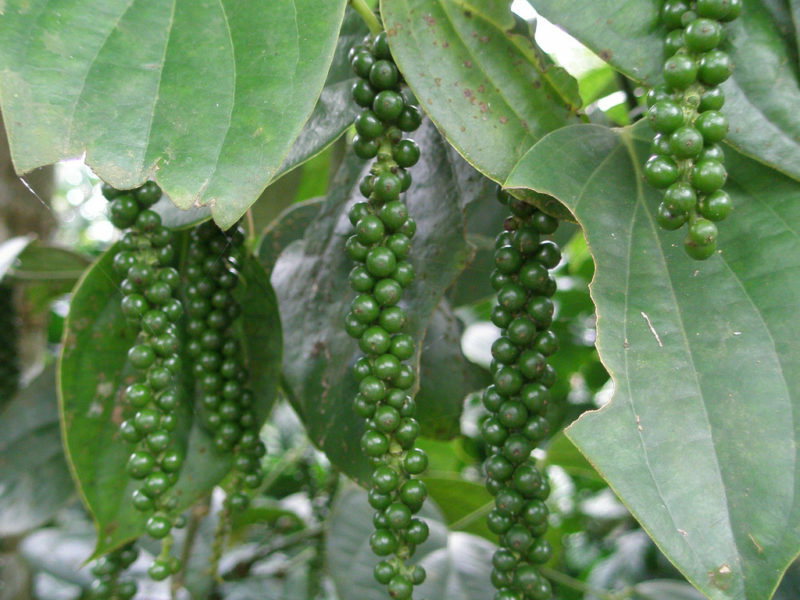 Black pepper is obtained when mature green or yellow berries of the pepper vine are harvested and dried. If the fruits are retted and skin (pericarp) along with the underlying pulp is removed before drying,white pepper is obtained. Both black and white pepper have a characteristic pungency and distinct aroma that makes these products essential ingredients in food from all parts of the world. Pepper finds a place on dining tables in all countries and all types of cuisine. Pepper has an important place in global trade in spices. Historically, it was the first spice to be traded internationally and largely responsible for opening up trade routes between the West and the East. Today, it is the most important spice traded,in terms of quantity as well as value, and accounts for a significant portion of world trade in spices. There are many uses of pepper. It is a popular ingredient in different cuisines, in the West as well as in Oriental cooking. With well-documented curative and restorative powers, pepper is used in traditional medicines in many parts of the world, as in Ayurvedic treatments in India and Jamu preparations in Indonesia. Oil of pepper is a constituent in certain perfumes. In the past, Egyptians used it in the embalming mixture and also as an air purifier. More recently, pepper has been found to improve the bio-availability of specific medicines during treatment of serious illness. Its insect repellent properties are also being exploited in agriculture and household use. Pepper has a chequered history. It is as old as human civilisation itself. The Assyrians and Babylonians (3000BC-2000BC) traded in pepper obtained from the Malabar Coast of India. The Vedas, the Bible and the Quran contain references to pepper. Expeditions in search of pepper led to the discovery of new trade routes.Wars have been fought and countries colonised to gain control over the supply of pepper and other spices. Among the 109 spices listed by the Geneva based International Standards Organisation, pepper is the most significant. In some tropical countries, pepper plays an important role in the economy of small farmers. These farmers plant,nurture, harvest and sell pepper for their livelihood.